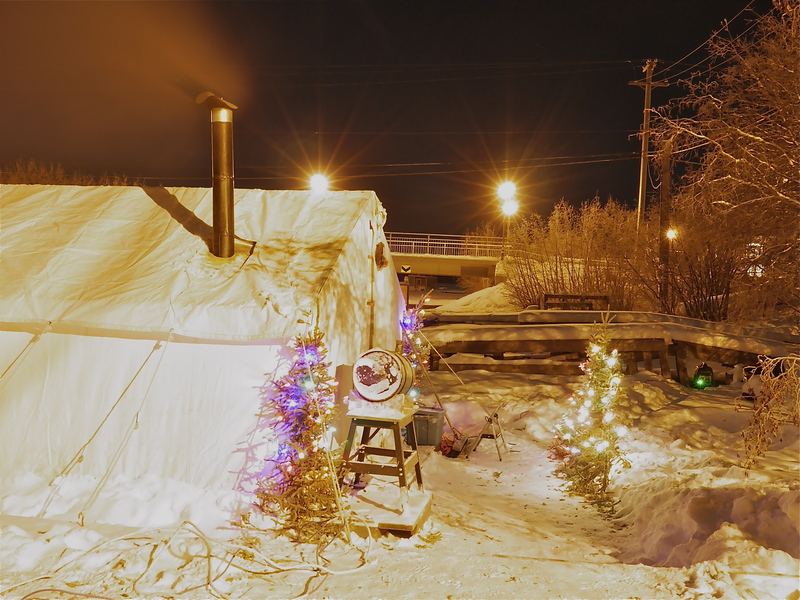 A friend asked to hear, in their own words, how my parents liked their visit to Yellowknife over the holidays. My dad, whom I call a bad Canadian, is not a fan of winter at the best of times, so I thought it was amazing that he would even consider coming. It was touch and go at the end, as while he was in the Edmonton airport there was a flight leaving for Cancun, and he was nearly sucked into that plane by the thought of those lovely warm Mexican temperatures. When they arrived I was so excited to take them out to cut down the tree, (see previous post My Charlie Brown Christmas Tree) and we had a lovely time. What I didn’t realize at the time was that our electronic thermometer wasn’t working correctly and was reading about 10 degrees warmer than the actual temperature. So I dragged them out in some pretty cold weather! But being the wonderful troopers that they are ( I mean that figuratively of course, my dad wouldn’t actually voluntarily troop anywhere on foot, although he’d always be up for a gas powered journey) they made the best of it. As I was driving them to the airport on their way home, I asked everyone what their favorite part of the holiday had been. Mine was cutting down our own Christmas tree and bringing it home by dog powered sled. 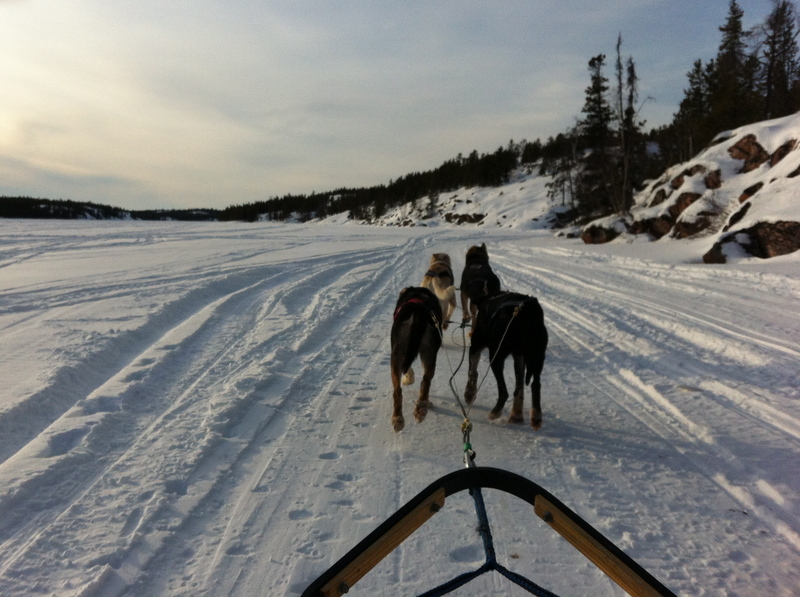 My mom loved best the dog sled ride we had on Christmas eve day. It was a very cold day and I’m sure with the wind on the open sled the temperature must have been close of minus 50. We were hugely bundled up, and lined up close to each other on the sled, and tucked in under warm sleeping bags, so we were warm enough. It was fun being out on the small open lakes, in sunshine, watching the scenery. Martin’s favorite part of the holiday was the dinner we were invited out for on Christmas eve. We had dinner out on the lake! 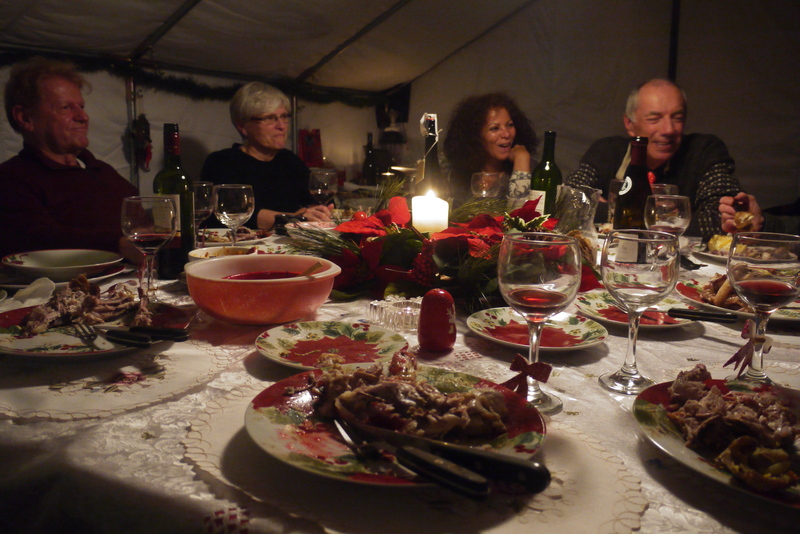 We weren’t really sure what to expect of a dinner in a tent, in winter, on the ice, in the dark, but it was actually very luxurious. Imagine a canvas walled traditional prospector style tent, but complete with stove, carpet, Christmas lights and a tree, music, and a table laden with beautifully decorated dishes. It was warm and comfortable, but when the 5 course meal appeared, including the main dish of Cornish game hen, we thought we”d died and gone to heaven. It was a wonderfully memorable dinner. Minus 30 Isn’t So Hard After All! So Tandi trudged us through the frost and frozen snow. To hopefully help keep your body parts WARM. Or be happy with the pictures in our book. Which brought some special light to this story. It is truly a land for the brave and the BOLD. We’ll probably head up that long road again. It is a time of year we’re glad we didn’t miss. It’ll take all year to prime us up again. Of course I love this poem, but if you know George, its all the more surprising as he not your basic literary type, as you might have guessed. 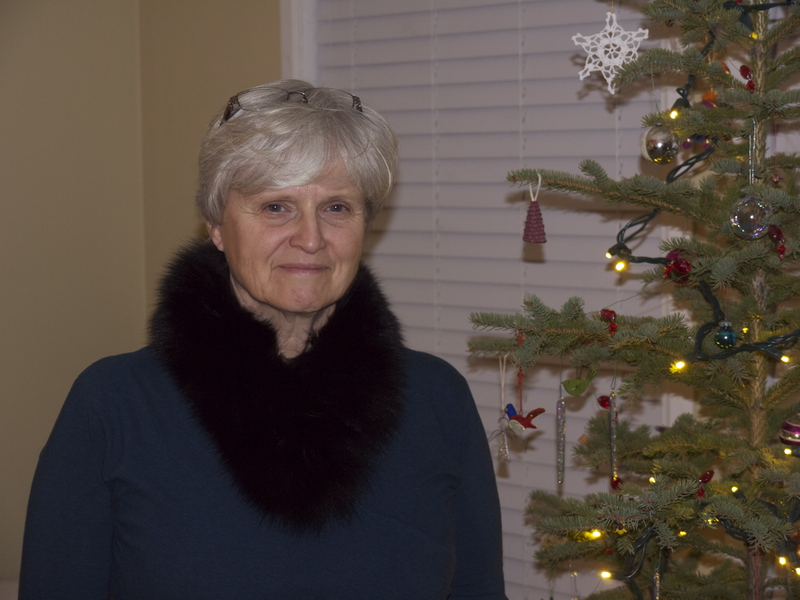 This entry was posted in North of 60, Poetry and tagged its cold!, winter. Bookmark the permalink. Beautiful post…again, and wonderful poem from your Dad ! I’m with George. I would’ve stayed home by the woodstove! But I love the sound of the sleigh ride and I can’t imagine how you kept warm in a tent? I didn’t realize you’d grown up in Canada. With your exotic name I thought you came from somewhere in Africa. What does your name mean? We were actually too hot in the tent. It was insulated and had a carpet, and a small stove for heat that was working vigorously. I wasn’t expecting that, I can tell you. My Dad read my name somewhere before I was born, but he can’t remember where. I have heard from South African friends that it is common in certain black communities there, and means one who is loved. My parents did alter the spelling, which I think is usually Tandee, or Tandy. Its quite a wonderful name I think, and I enjoy having one the is relatively unique. I haven’t met many in Canada. I can’t imagine feeling too hot in a tent in the frozen north! Its amazing how man has adapted to living up there. When I first met you I thought you were South African because Tandi (spelled Thandi.with a silent “h” like ‘Thames’) is a Zulu name and yes it means the loved one. It is a lovely name. I love reading your blog Tandi!! Especially the updates that include Karen and George!! I miss you all. Hi to you and Martin! I keep getting caught by the wonderful similarities between sand and snow. Now there’s another – the sight of that tent, and the memories of the tents in desert Africa. Your folks’ trip makes me smile. After my dad retired, they had planned to go to Arizona. One day Dad wandered into the kitchen and said, “As long as we’re going all the way to Arizona, why don’t we go to Liberia and visit Linda”. And so they did. Has your propane ungelled yet?